The birth of the Modern Age in the history of Europe resulted in a number of scientific inventions, geographical findings and revolutionary ideas. These affected not only the lives of the common Europeans, but it brought far-reaching changes in the whole of Europe. The period of the Renaissance symbolizes the transition from the medieval world to the modern age. 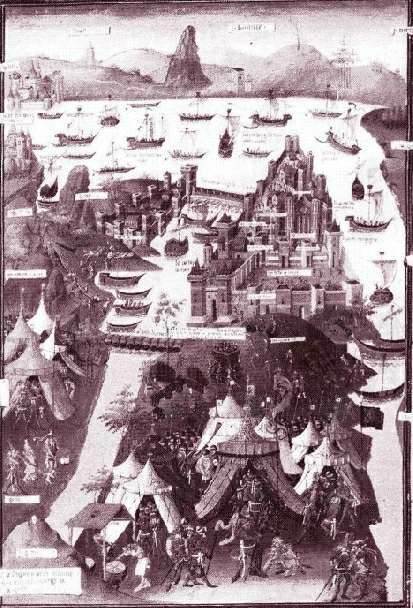 When Constantinople fell into the hands of the Turks, most of the scholars belonging to Greece took shelter in Italy. The ideas and thoughts of these scholars spread in Italy. Due to this a new wind of knowledge started to blow there. This encouraged perceptive people to question the out-moded attitudes of people and the blind acceptance of orders from the ruling authorities. It asserted the dignity of human beings and the personality of every individual. European Scholars revived the learning of Greek and Roman cultures. This appreciation contained the basic elements that brought about revolutionary changes in the socio-economic and political areas of Europe. In 1443, when these scholars took shelter in Italy, they contributed to the spread of ideas. These ideas were new modes of thought and different approaches to life. The very idea of blindly following authority (as in medieval times) was now questioned. Men started to look towards freedom and liberal ideas with great interest. They were no longer ready to suffer repression. They started asserting the dignity of man, his labor and appreciated his individualism. The spirit of Humanism spread with the wave of "Modern learning" and classical liberalism. Every aspect of the ‘human person’ was studied in depth. The Medieval Church had discouraged progressive ideas on human affairs, and had strongly supported self-repression and asceticism. The writings of Erasmus influenced men intensely. Through his writings he was successful in bringing about religious reform. He criticized the ignorance and credulity of monks though he himself became priest and doctor of sacred theology. If the humanists were critical of the church and of Christianity as popularly practiced in Europe in the early 16th century, many were quite unsympathetic about the religious upheaval which later in the century, produced Protestantism and promoted religious intolerance and fanaticism. It was only Melanchthon, among these early humanists, who actually seceded from the Catholic Church. However, he was peculiarly compromising and was only a mild Protestant. Outside the universities the humanities were especially fostered by a new institution. This was the Academy, a voluntary association that arose in a particular city or locality in imitation of the ancient academy of Plato. It patronized the pursuit and publication of scholarly, literary and scientific studies. In the "Middle Ages" learning and culture were sectarian as the Christian church had dominance in the fields of art, science and letters. As a popular secular movement, the Renaissance helped to promote a spirit of individualism. At a certain point in time it also assumed the character of a revolt against the ecclesiastical monopoly on life and culture, thus, freeing the latter from the vicious hold of the church. The spirit of critical inquiry and a wider outlook towards life resulted in the freedom from ecclesiastical tutelage. Newer and livelier trends were developed in architecture, sculpture, music etc. The Renaissance focused attention on Pagan culture and all its aspects came under its direct influence. This led to the development of multi-dimensional arts. Michaelangelo, Leonardo da Vinci, Raphael, Tiran etc. were some of the great artists of this age. Although their art was basically Christian, the Renaissance encouraged the adaptation of classical art forms.